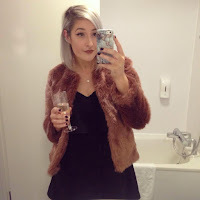 Floral Danielle: Wednesday wishlist #13 - The first of 2014! I actually have a Motel Rocks wishlist which is longer than my arm, but I'm really loving this silver skirt at the moment. It would look so nice on a night out dressed like it has been styled on this model, or with a black turtle neck and thick black tights! I'm not really sure when or how I would wear this bodysuit, but I think it's really nice and the wording is cute! It reminds me of witching hour! The UK price of £17 was converted from the American price of $28, so it's a right bargain! This dress doesn't look AMAZING in the picture, but after seeing it on someone in real life I really liked it! I'm hoping it'll come in store or onto the Asos website soon (so that I can nab my student discount ontop!) I love a good old tea dress! This necklace is currently out of stock, but as soon as it comes back, it is mine! Along with the moon ring which I posted in a previous wishlist post here! I absolutely love all of things on the Empty Casket website and the owner Lucy is lovely! I've been looking for the perfect tartan skirt for a while now and I think this may just be it! I love the navy and dark green patterned tartan and even though the popular Primark dress didn't suit me, I would love to give it another go with a skirt! I quite like the zip details and I would wear it with a little black turtle neck and black tights! What's your favourite thing outta my Wednesday wishlist? What's currently on your own wishlist? I love the t-bar shoes. They're adorable. I need to invest in the perfect flats for Summer and I think I might have to treat myself to these beauties. I know I'm definitely going to! The skirt from Missguided is so nice! I've never bought anything from there before, I never think to look! I know, isn't it so cute?! I do need to get me some tartan! i like them all but i luuuurve that tartan skirt its delicious! Awesome!! Loving the tartan trend (which I currently just did a post on too). Also my room is FULL of white decorations, I bought a wall-mount pair of white antlers from UO which work AMAZING as a jewelry-hanger! Love the shoes and the plaid skirt ♥ Great wishlist! If that's actually your name, it's pretty damn cool! I do love love love that metallic skirt! I LOVE that metallic skirt! I'm actually going to a 21st soon and was looking for something, I think I've found that something now! Thanks! Especially with that discount code! Let me know if you end up buying it! I do love the dress! Wouldn't they make such a cute outfit? !